Apache trout are a yellowish-gold color with a golden belly and have medium-sized dark spots that are evenly spaced and that may extend below the lateral line and onto the dorsal and tail fins. The top of its head and back are dark olive in color, and it has the appearance of having a black stripe/mask through each of its eyes, due to two small black dots on either side of the pupil. There is a cutthroat mark below the lower jaw, ranging in color from yellow to gold. Recovery and management efforts for Apache trout have been ongoing since the 1940s. Apache trout are raised in Federal and state hatcheries, and reared fish have been used to assist with recovery and to maintain populations for sport fishing in certain streams and reservoirs. 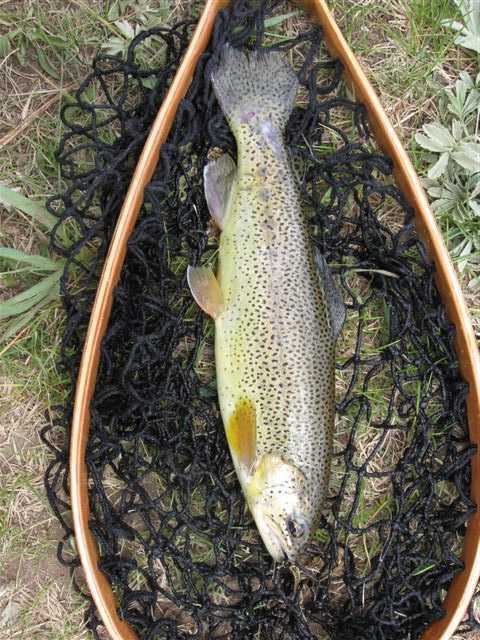 Today, the main risk to the Apache trout is its easy hybridization with the rainbow trout. Populations that are considered to be genetically contaminated (containing hybrids) are exterminated. Cutthroat trout are also genetically similar and cross-breed with Apache trout, compromising the genetic purity of each species. The range of the Apache trout remains limited, which puts it at risk, but it is now common enough that limited fishing is permitted. Many of the Mount Baldy headwater streams that are the stronghold of Apache trout are entirely closed to fishing. Catch and release fishing opportunities for wild (stream born), pure-strain Apache trout exist in a limited number of areas. Additionally, there are numerous consumptive fishing opportunities for Apache trout in waters where natural reproduction isn't occurring and the Apache trout population is the result of stocking efforts.